Setting a strong password for your WiFi leads us to forget many times. However, recovering the saved password for the WiFi network which was connected previously to the computer, is really simple. As well, there are many free ways you can view saved WiFi password on other devices. To make the process easier, you can download a third-party tool to view the saved WiFi passwords of all previously connected networks. WirelessKeyView is the best tool to view saved WiFi password on your Windows PC. WirelessKeyView, the perfect wireless key viewer is available in both 34-bit and 64-bit for Windows OS. This tiny size (75kb) tool can be downloaded quickly to install it in few seconds and start the scanning process to see the WiFi password. You will be able to figure out the password instantly once you run the tool on your computer. This tool automatically shows all the saved networks and password keys by a list. WirelessKeyView also displays the security types (WPA, WPA2-PSK) for the networks. This tool is very useful and shows the results quickly. Let's discuss some features of this tool in details. WirelessKeyView can run on Windows OS in both 32-bit and 64-bit. This tool shows the passwords of all networks in plain text. There is nothing to change to see the saved key. WirelessKeyView displays all passwords for connected and disconnected networks as well. The process is automatic. The size of this tool is really light. It is as tiny as 75kb in size. This program will scan your all windows registry and then extract all saved Wi-Fi passwords from that computer. At first, Download WirelessKeyView software. On the download page, you will see Download WirelessKeyView 32-bit & 64-bit, just download and complete the installation. Then open it and you will see WirelessKeyView application. Just double-click on the file. 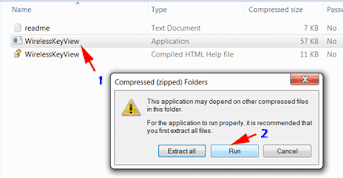 Then click on 'Run' option as it is a zipped file. After that, you will find all saved Wi-Fi passwords for the connected or disconnected networks which were saved on your PC previously. If you want the quickest solution to get the saved WiFi password then just download this tool as a first choice to start the process.